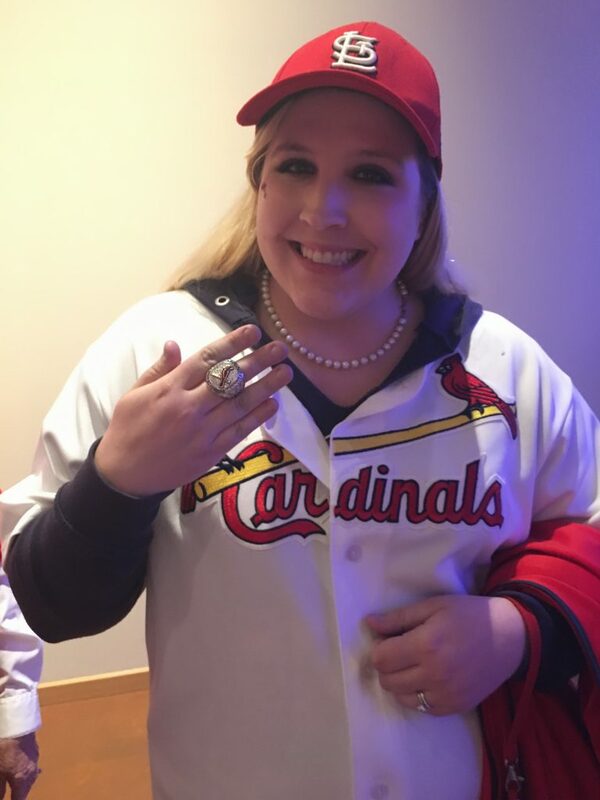 Today’s post is all about me geeking out with my dad on our trip to St. Louis at the Cardinals Museum and Hall of Fame! It’s located at the new Ballpark Village right next to Busch Stadium in St. Louis. 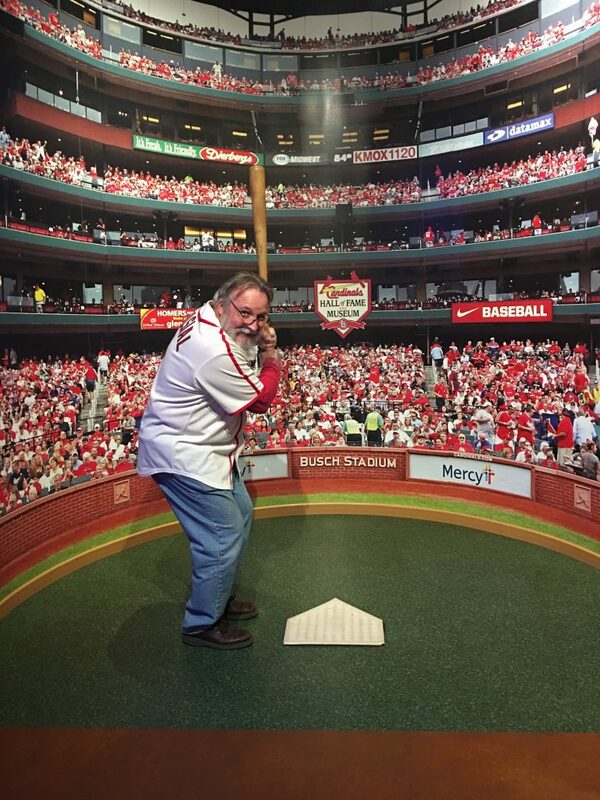 The Cardinals Museum and Hall of Fame was recently moved to Ballpark Village, and my dad was super excited to go see its new location! 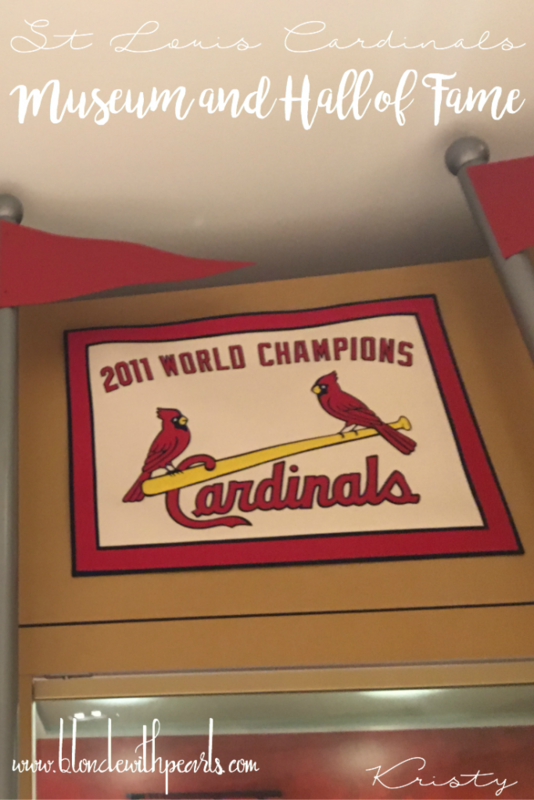 The coolest part of the museum is a station where you can hold game used bats by various Cardinals players as well as 2006 and 2011 World Series rings! 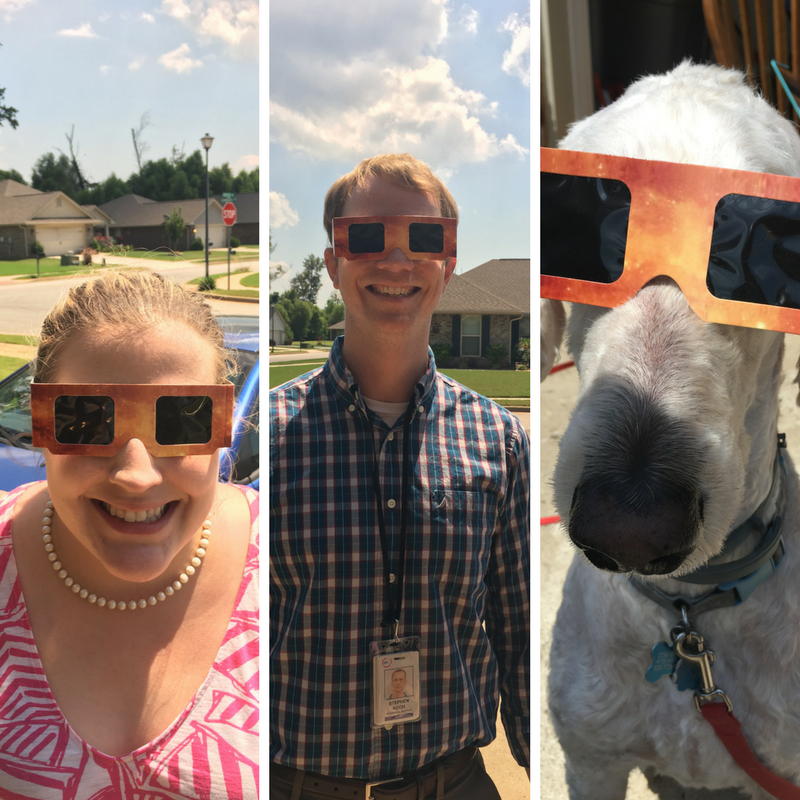 This was exciting for all of us! They had like 5-6 different bats, and you go to pick one of them and take a picture with it! 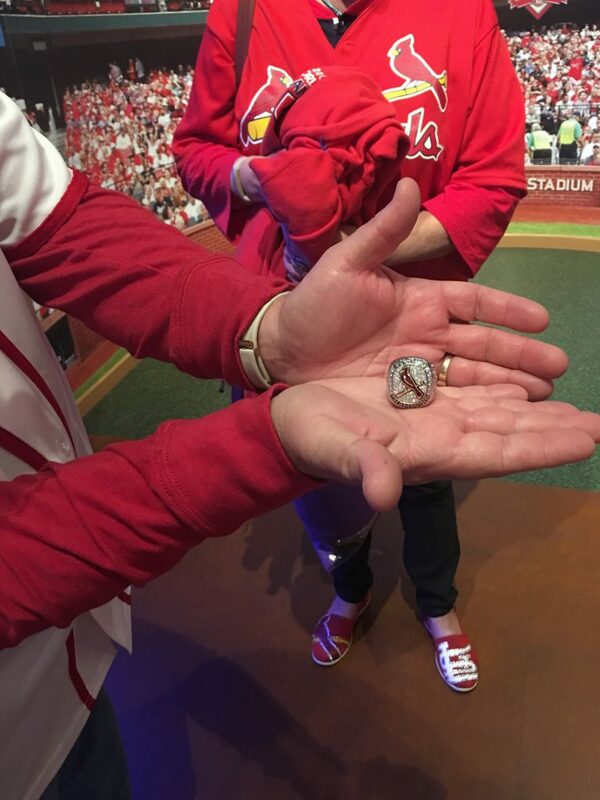 This was my favorite part because my dad was so excited to hold Stan Musial’s bat! 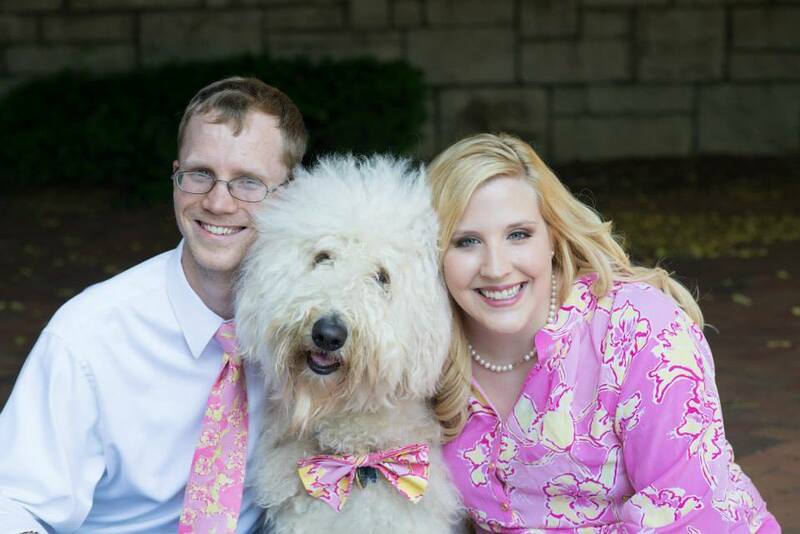 You can just see the little boy inside of him coming out in this picture! 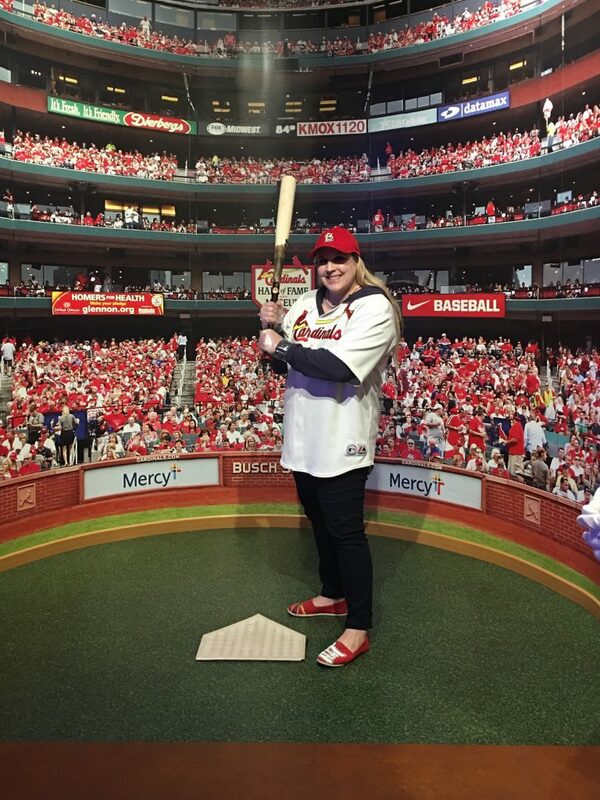 I got to hold Yadier Molina’s bat, which was incredibly cool! The rings were really awesome too! 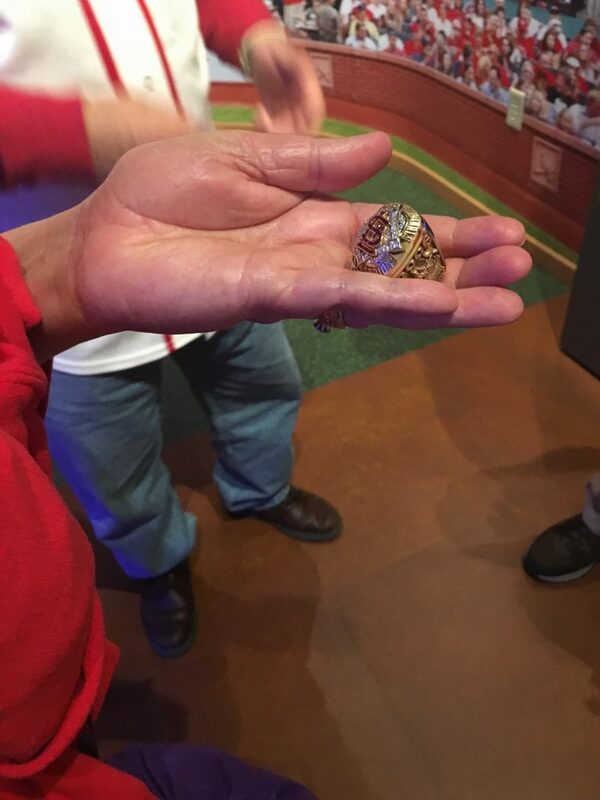 They had the rings from the 2 most recent World Series. These suckers were so heavy! 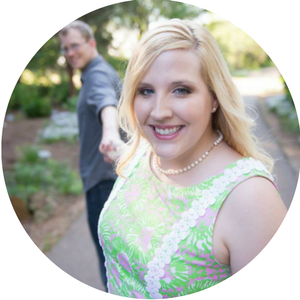 They’re covered with diamonds and rubies and engraved! 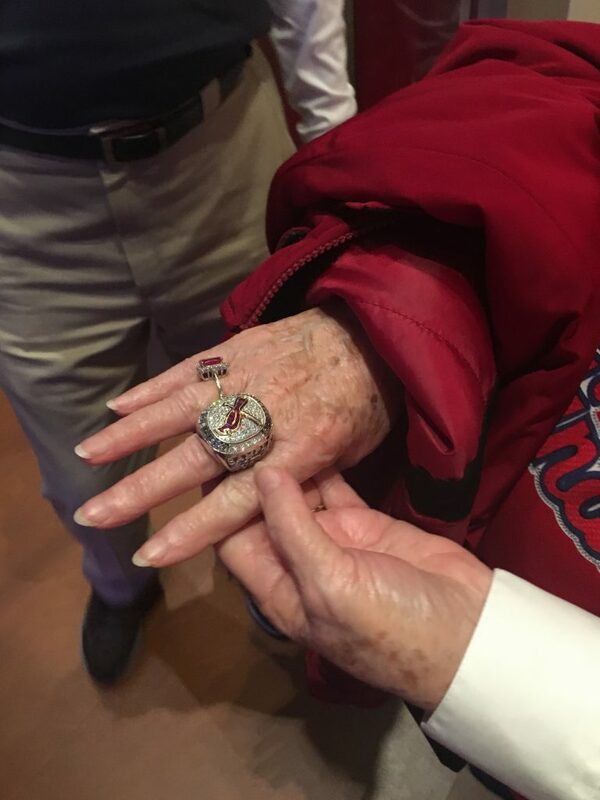 My great-aunt said she was too old to hold the baseball bat, but she was for sure trying on these rings! 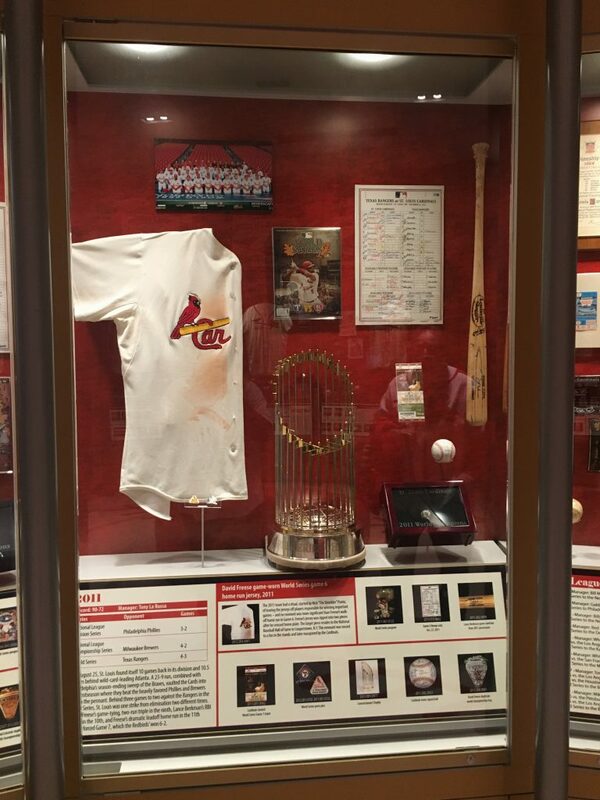 The beginning of the museum is all about the history of the Cardinals. I’m a terrible person because I didn’t take any pictures at all of this portion! I’d been to the museum before at its prior location, so I’d seen most of the stuff already. I do think that the Cardinals’ rich history is very cool. The Cardinals date back to the late 1892! They were originally the St. Louis Browns, but changed their name to Cardinals in the early 1900’s after briefly being called the St. Louis Perfectos. Around that same time an American League team came to St. Louis and was called the Browns. 1944 was the only all St. Louis World Series with the Browns defeating the Cardinals. They’ve won 11 World Series Championships. 43 Hall of Fame players have played on the Cardinals at one point in their career, and 10 of them wear the Cardinals logo on their hats in the Hall of Fame. The name Cardinals aren’t named after the birds on the bat like most people think. A reporter overheard a woman describe the St. Louis Perfecto’s socks as “a lovely shade of cardinal” and called the team “Cardinals” in his article. 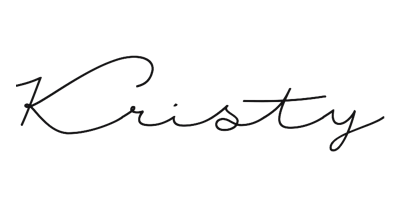 The nickname was clearly popular enough to become the official name of the team. My dad loved seeing all of the Cardinals memorabilia from when he was younger. They had all kinds of game used uniforms, equipment, bats, and balls from all eras of the Cards! I took pictures of and paid a lot closer attention to the recent history. I remember watching the 2006 playoffs and World Series in my dorm room on a tiny TV with my BFF Regan. My parents and I watched a portion of the 2011 playoffs from our hotel in Orlando when we were visiting the Wizarding World of Harry Potter. I watched the World Series with my dad. So the memorabilia from these years held fun memories for me! Chris Carpenter’s jersey from 2006! Half of David Freese’s jersey from 2011 game 6! You finish out your tour at the Cardinals Hall of Fame. I was super excited to see Jim Edmonds’s plaque up on the wall here! He is my favorite Cardinal of all time! It was also cool to see Chris Carpenter’s! 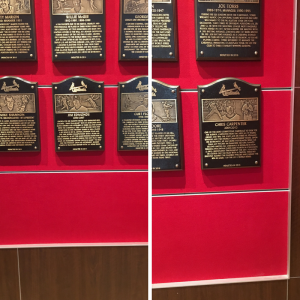 Jim Edmonds (left) and Chris Carpenter (right) Cardinals Hall of Fame plaques. It doesn’t seem like it, but we spend at least 2 hours looking at everything in the museum! We had a great time looking over all the memories and history of this great ball club! 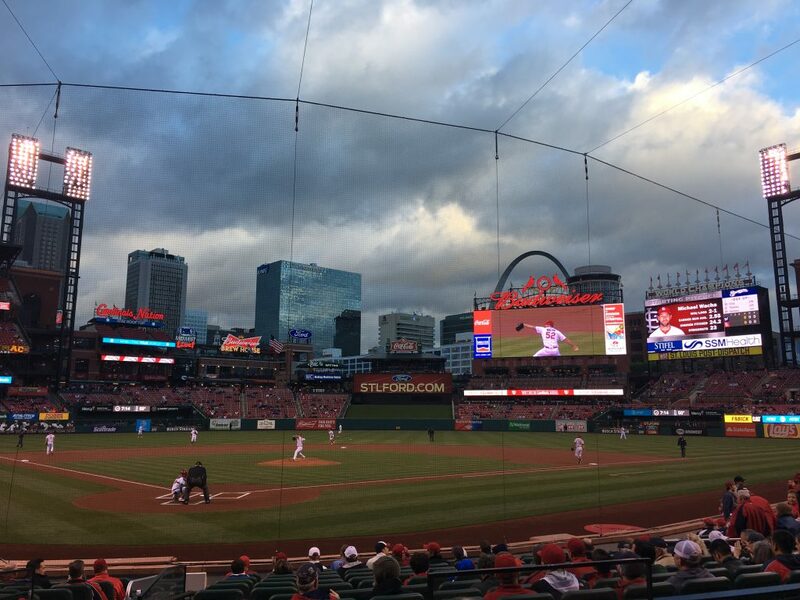 We followed it up with a game at Busch Stadium! 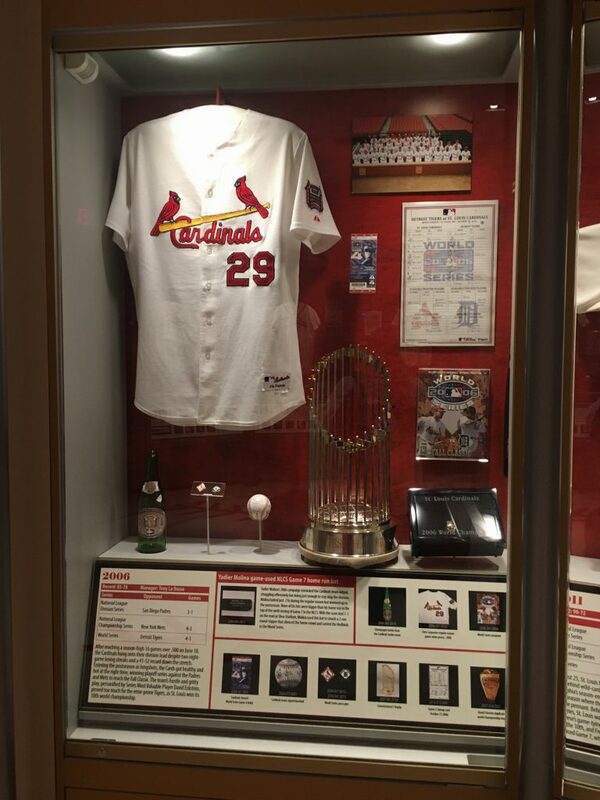 I definitely will go back to the Cardinals Museum and Hall of Fame! I’d recommend it to anyone as the Cards are one of baseball’s oldest teams! Have you ever been? Have you been to an awesome sports museum?